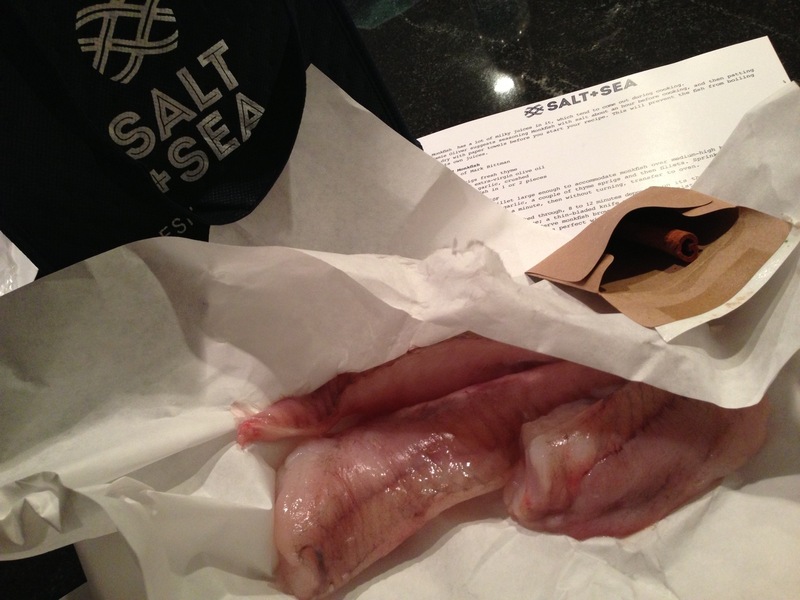 The just-caught fresh monkfish tails from Salt & Sea Community-Supported Fishery, with a spice packet of cinnamon sticks and whole cloves to simmer on the stove separately as the fish cooks, to eliminate any lingering fishy odors. I love Community-Supported Agriculture (CSAs), though I was hardly an early adopter. I used to think they’d be too confining and limit the spontaneity of buying what one stumbled upon at the market. But CSAs are economical and efficient. They’re all about the paradox of choice. Having a fixed set of ingredients to work with makes dinner preparation faster and in many ways, more enjoyable. You’re allowed infinite freedom and creativity under these restraints. You also spend less time wandering aimlessly around the market. We did our first CSA, a winter share, last year through the Willamette Valley’s Open Oak Farm. We learned that eating truly local through the winter means embracing more bitter greens, such as escarole. Last spring, we also dabbled in a start-up cured and fresh meat CSA. Now we’re doing a wonderful fall CSA with Small Wonder Organics here. But we’ve never before had the opportunity to become a member of a Community-Support Fishery. Until now. I salted the fresh monkfish fillets (which are actually the meaty tails) and let them sit an hour, then drained them and patted them dry. 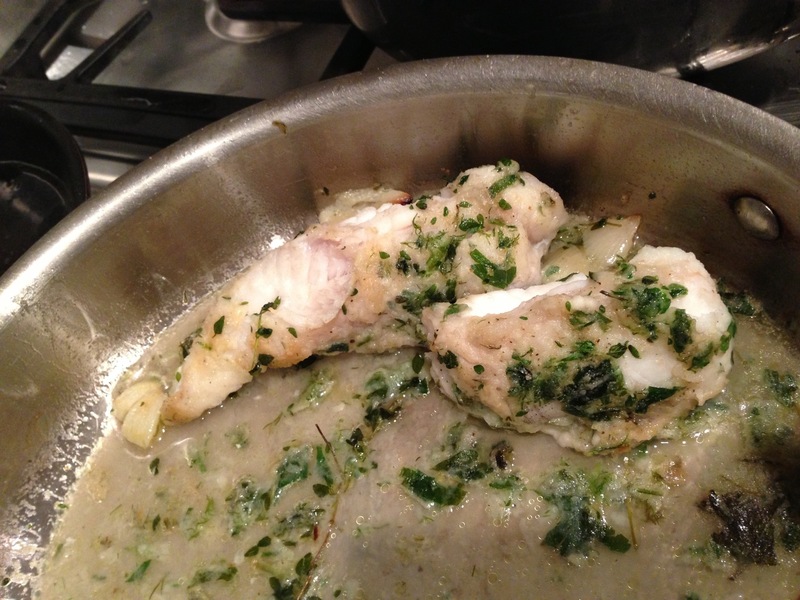 Jamie Oliver recommends this step to prevent the monkfish from becoming mushy by boiling in its milky juices. I also tried to remove as much of the thin gray membrane as possible, using my fingers and sharp knife. Coastal Maine is home to Port Clyde Fresh Catch, the nation’s first community-supported fishery. But I found the start-up Salt & Sea C.S.F. even closer to home. Fish is supplied from medium-sized trawlers and small gill-netters run by the Odlins, a fourth-generation old Portland fishing family, their cousins and other local Portland fisherman. Salt & Sea’s Justine Simon, who married into the family, says the experience for members mimics how fisherman share fish with their families when they come home from trips, trading recipes and fresh filets. The goal is to create new markets for more sustainable, but often less appreciated and unknown, varieties of fish. Simon says all their species are plentiful in the Gulf of Maine. Like monkfish. 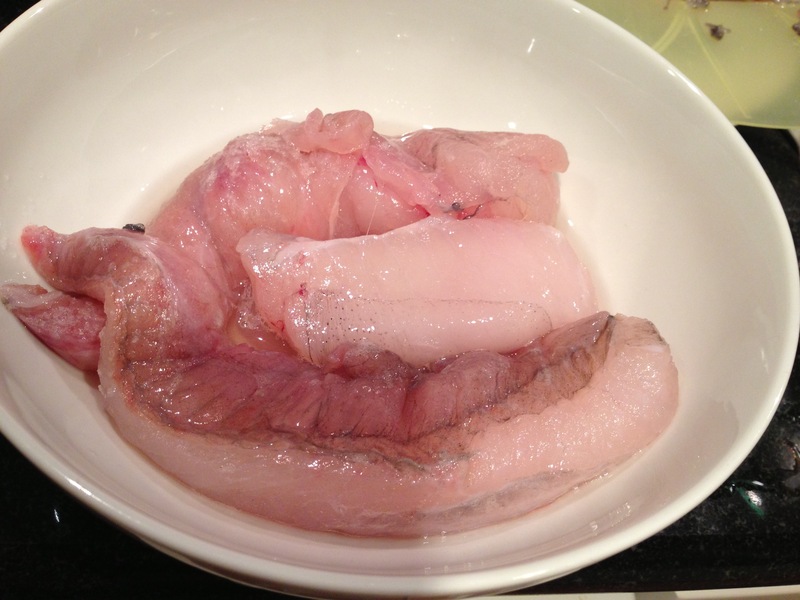 I picked up my first installment, a pound of monkfish, at the weekly drop-off site at Morning Glory Natural Foods in Brunswick. We need more members to keep this drop-off site viable, so tell your local friends! It was so fresh, with no fishy aroma. For those who are squeamish about fish (do those people, who are not vegan or vegetarians, even still exist? ), Salt & Sea included a cute little packet of spices to simmer in a small pot before you start cooking your fish, to combat fishy aromas. They also included a recipe card for “Roasted Monkfish,” to take the guesswork out of how to cook this new fish. The recipe came from Mark Bittman’s How to Cook Everything. I dredged the monkfish steaks in a mixture of flour and chopped herbs, salt and pepper and preheated the oven to 450 degrees. I seared the fish in a hot skillet, browning on all sides to develop a crust. I added broth to the pan and then transferred it to the hot oven to cook until it was tender. And tender and sweet it was. Now I just have to ask Salt & Sea how to get my hands on monkfish liver, a Japanese delicacy I once enjoyed at a cute Brooklyn sushi spot, whose name now escapes me, with my sister-in-law, Julia. Simmering the spices to negate the smells of the fish sounds like a good idea. Did it work? It did! But at the same time fish was so fresh hardly any smells to cover up! wow this looks great! i’ve never had monkfish, but i sort of nicknamed my 5 year old son, mini monk fish. so this post kinda made me chuckle.